measurement system for plastic bottles. Simple to set up – Automatic bottle learn features. Flexible – Accommodates a range of bottle shapes and sizes. The AVBIS 3000 C combines all the measurement capabilities and simplicity of the basic AVBIS 3000 M system with an automatic loading system to provide a fully automated bottle measurement system. 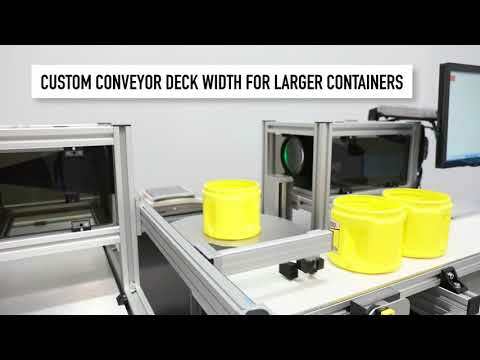 The system requires only that the operator load the bottles onto the conveyor, select the appropriate part program from the product library and the total number of bottles to be measured. The system then loads, measures and ejects all bottles automatically, freeing the user for other tasks. Standard and non-standard finishes can be measured with ease. An onboard library of standard ISBT/SPI neck finish profiles can be loaded to simplify initial setup. Non-standard or unique finishes can be quickly created using the AVBIS’ new automatic “learning” feature that identifies most standard dimensions. Magnetic loading attachments for the load arm are quickly switched to accommodate unique or non-round bottles for auto-loading. Loading speed is a part-specific setting and is easily adjusted for unstable or “top-heavy” parts. The standard AVBIS 3000 C system can accommodate a range of bottle sizes up to 15" in height and 10" in diameter. Customization is available for larger or smaller products. While the AVBIS 3000 C is primarily designed to handle and measure bottles, the system can also measure preforms when loaded manually into a fixture on the rotary stage. This gives the system flexibility in environments where preforms need to be checked on an infrequent basis. Prospective customers interested in preform-only applications should seek the AVBIS 3000P.